It took about an hour to run the install on my 2-year-old Mac mini. Can’t wait to take a look after I get back from lunch. I must have been dozing off and missed this. Microsoft released an update for its Key Management Server, version 1.2, to support Windows 7 and Server 2008 R2. This allows volume license customers to perform activation related functions of the operating systems on their corporate networks. I was hunting this down in early August when the Windows 7 RTM bits were released. It wasn’t out then, but I am glad it is now. Time to lab up a VM to test out the install. Our business has been using Cisco’s Unified Communication Manager for several years now. For the most part, our employees use their IP phone just like they previously used their old digital PBX handsets – it’s a phone. If you are looking for cool (and free) way to start doing some CTI, check out Cisco’s free widget called “Click to Call“. 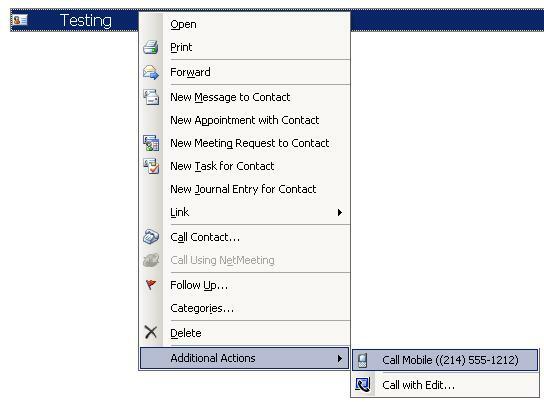 Built on .Net framework 3.0, Click to Call utilizes the same Webdialer functions available on your CCM user page. Except now you can place calls from Outlook, Sharepoint, web browsers, or any other Microsoft Office application. In fact, anything that you can copy to the clipboard can be dialed. I’ve included a screen shot below of dialing from Outlook. Presto … phone goes off hook and the call starts. This is a great way to expand available functionality before jumping off the cliff into Presence and the Cisco Unified Personal Communicator. While working on my recent Cisco WCS upgrade project, I was looking for information on unneeded services that could be disabled. After a few Google searches, I ran across a really good publication from the NSA. It is a two-page pamphlet titled “Hardening Tips For Default Installation of Red Hat Enterprise Linux 5“. They also have a more detailed publication, but I found this document to be a great pocket guide to get you started. Today I started labbing up a future upgrade to our Cisco Wireless Control System software. We are currently running version 5.0.56.2 on Windows Server 2003. The latest version is 6.0.132.0, but there is no direct upgrade path for the database. So we have to move up to 5.2.130.0 first, and then upgrade again to the latest build. The root password must be eight characters and meet the password complexity. I selected a password that met this criteria, but it would not accept it. I ultimately had to pick a longer more complex password to get past that hurdle (which gets overwritten when I restore the DB). If you change the system host name after installing WCS, the WCS service will not start the next time you either manually restart the service or reboot the box. So set your hostname before you install WCS. Outside of that, the restore worked just fine. So I moved on to the first upgrade. WCS version 5.2.130.0 installed without issue, and the WCS web interface came up normally after logging in. So I moved on to the second upgrade. After installing WCS 6.0.132.0, I started seeing a strange error message after logging into the WCS web interface. The error said “System Error: Wrong Alarm Type rogueUclassifiedMinor” and a quick Google / Cisco search yielded no help. So I have opened a TAC case. More details to come on the final solution. The error message I was seeing went away. The TAC engineer was able to help me determine that the error was related to Cisco bug ID CSCsr02317. After upgrading the WCS this happens. Clear the browser cache and cookies. Restart browser and the error message should go away. Finished migrating the WCS virtual machine back to the original server (which is now an ESXi box). It runs great, and that is one less server license to pay Microsoft for. So Linux came to mind, but which distro should I go with? I started to head over to Fedora, but then Ubuntu popped into my head. So I went for it. I downloaded and installed desktop 9.04. It was very simple to install, and it came loaded with enough stuff to be useful right out of the gate. I ran all the updates, installed Skype, and now it is ready to go.